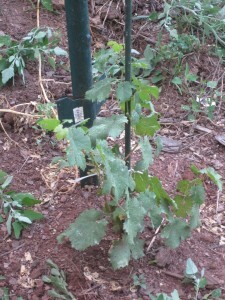 Well, I thought it was time to start introducing everyone to the vines I’ve planted, starting with the Fairfax vineyard. 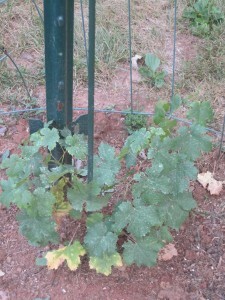 As I’ve said in the past, seven vines hardly constitutes a vineyard, and yet it’s big enough to yield enough grapes for five gallons of wine — about 30 bottles — when I get my first real harvest in three or four years. Not too shabby. The vines in Fairfax are growing like Topsy, and I wonder sometimes if there’s too much vigor in this vineyard. Vines themselves are capable of amazing growth. They can grow higher than the trees in our yard, and we have really tall trees. But that’s not what we’re looking for. In these first few years, we want to funnel the energy of the vine into the development of the root system, and after that, into the grapes themselves. What we don’t want is for the vine itself to grow out of control, stealing vigor from the roots in the first years and the grapes thereafter. The rootstock on these vines is of a type known as 101-14, which is a low vigor rootstock. And basically, I think we’re doing okay. We’ll see. But for now, let me introduce you to the Magnificent 7 (and believe me, they are magnificent! 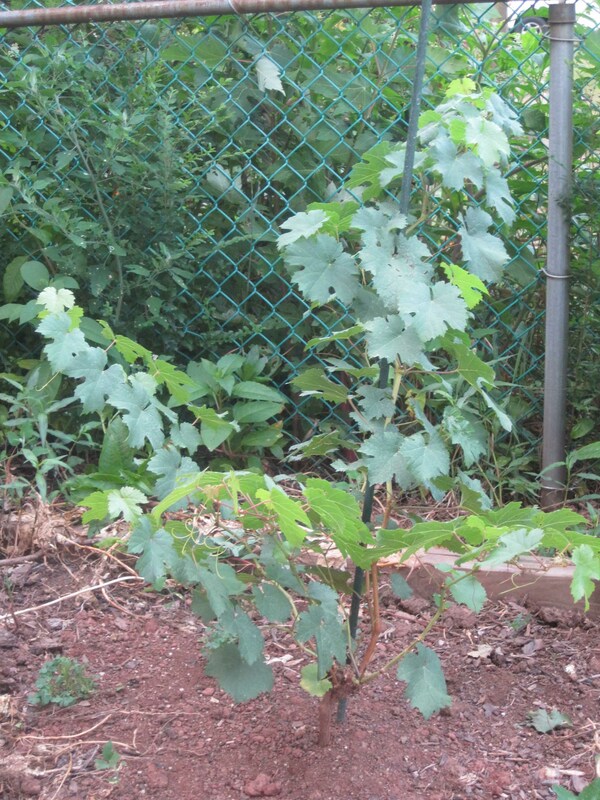 ), one vine at a time. FYI, they are all Cab Franc. 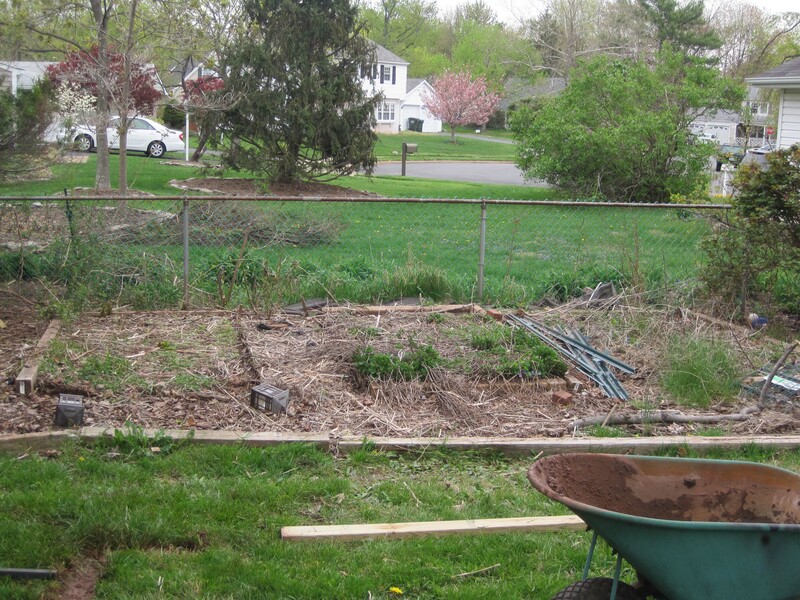 First, here’s the back row, closest to the backyard fence (you can see a patch of Day Lilies, with a few unpulled weeds, on the other side of the fence). This row also has a rose bush between the two vines. And here’s the middle row. The vines are all tied to faux bamboo poles. The large stake next to them is a leftover from the initial planting, before I had a fence up and was worried that the lawn service might mow them down without a few obstacles. 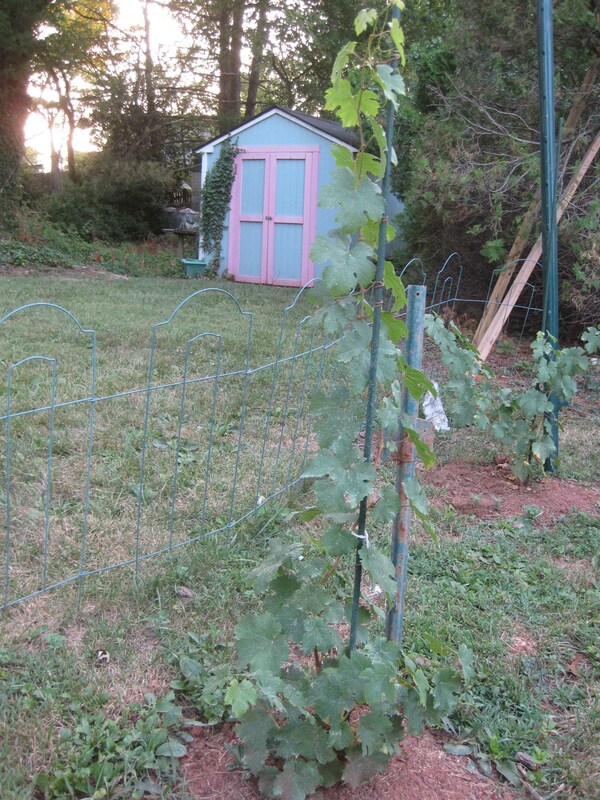 Finally, the third row, three vines strong. 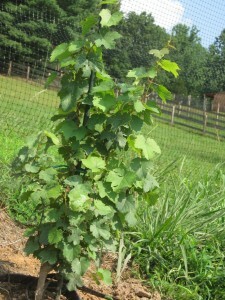 The middle vine is the giant of the group, nearly five feet tall, and the last is the runt of the litter. 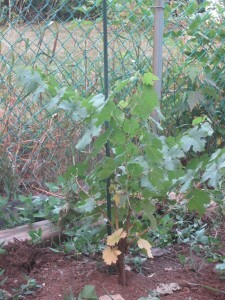 But I have every confidence that the little guy will produce great wine grapes someday, maybe the best in the vineyard. So there it is. The vineyard ain’t huge, but it has loads of personality! 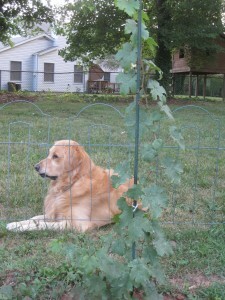 And here’s a couple of shots that illustrate the humble beginnings of this patch of vines. And here's a wider shot. 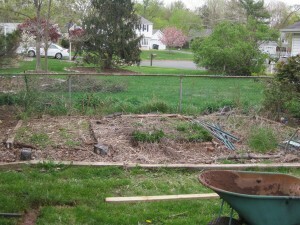 Note the wheelbarrow in the foreground, a sure sign that I'm about to get my hands dirty. A cluster of grapes that will never be wine. This is only a guess, albeit a somewhat educated guess, but I suspect every vineyard worker has the same uneasy, guilty feeling the first time he drops fruit from a vine. By dropping fruit, I mean walking through the vineyard, from one vine to the next, and cutting off perfectly good clusters of grapes and letting them fall to the ground. It seems wasteful, and when you see a cluster of nearly perfect grapes lying on the ground next to your feet, you feel like a butcher. But you have to remain focused and keep your eye on the prize. 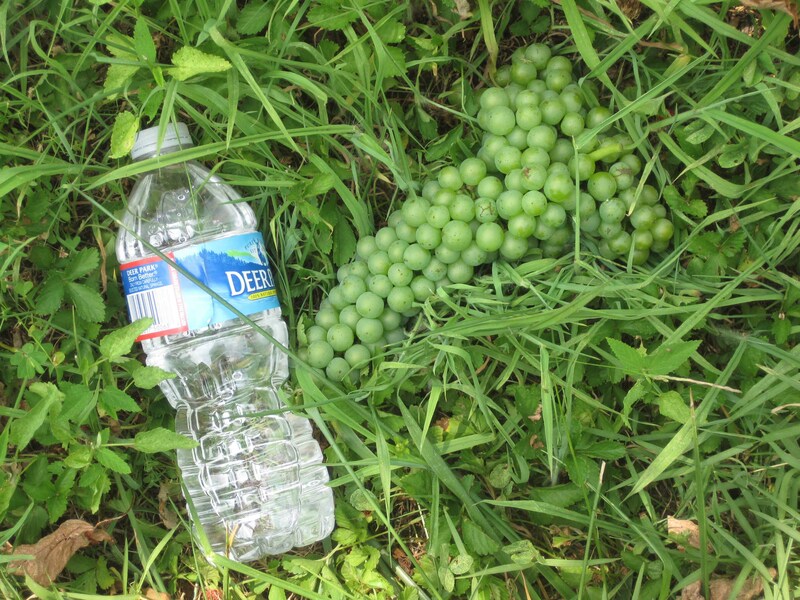 “Think about the wine,” said Julien Durantie, the vineyard manager at DuCard Vineyards. Ah, yes, the wine. 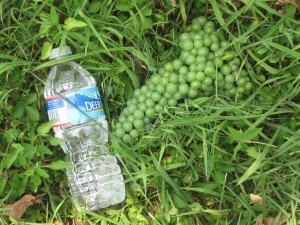 Don’t worry about the grapes on the ground that will soon rot and return to the soil to nurture future crops. Think ahead a year or more to the wine that will be made from the fruit that remains. Bob “The Butcher” ruthlessly hacking fruit. 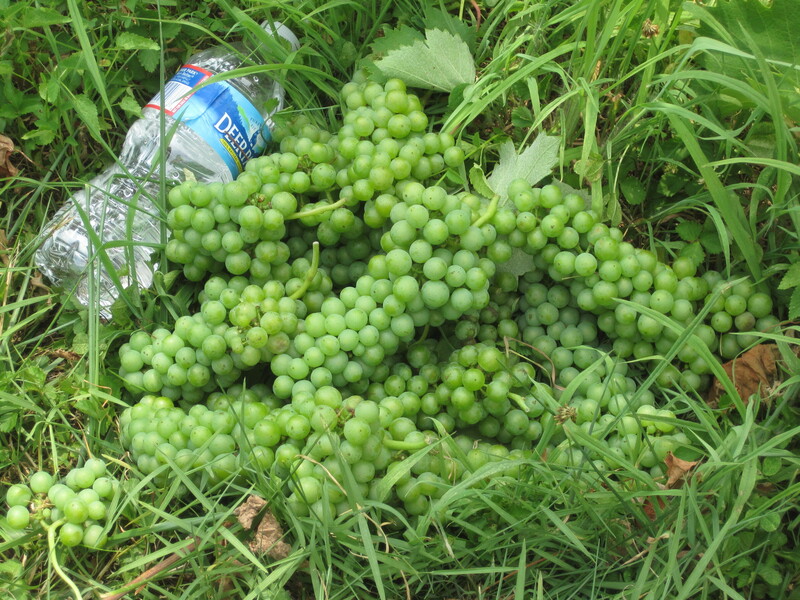 The idea behind dropping fruit is simple: the vine has only so much energy, and by reducing the number of clusters, you end up with a more concentrated juice and much better, much more intense wine. In a sense, this is a continuation of the process we’ve been engaged in throughout the growing season. Early on, we thinned out the shoots, leaving behind a smaller number of shoots that we hoped would produce high-quality grapes. 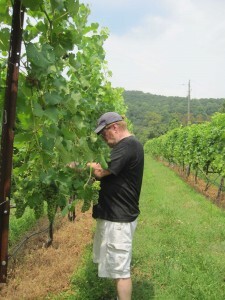 As we moved through the season, pulling leaves to open up the canopy, we continued to remove suckers, laterals, and extra shoots that would deprive the vine of its vigor. Removing suckers and thinning shoots was one thing. Clipping off beautiful clusters of berries that were turning into wine grapes, was much harder. I tried to keep my mind focused on the wine. As was the case in many classes before, I found myself nearly paralyzed at the start, not quite remembering what I had been told, and staring at the vine, afraid to make the first cut. And so, I spent time separating out vines that had become tangled, pulling some laterals (which look like a small, separate leaf system), and considering whether to cut this clump or the next one. And finally, as always, I called Scott Eliff, the vineyard’s owner, or Julien, and begged for help. We were working just at the onset of veraison, the time in which the berries change color. 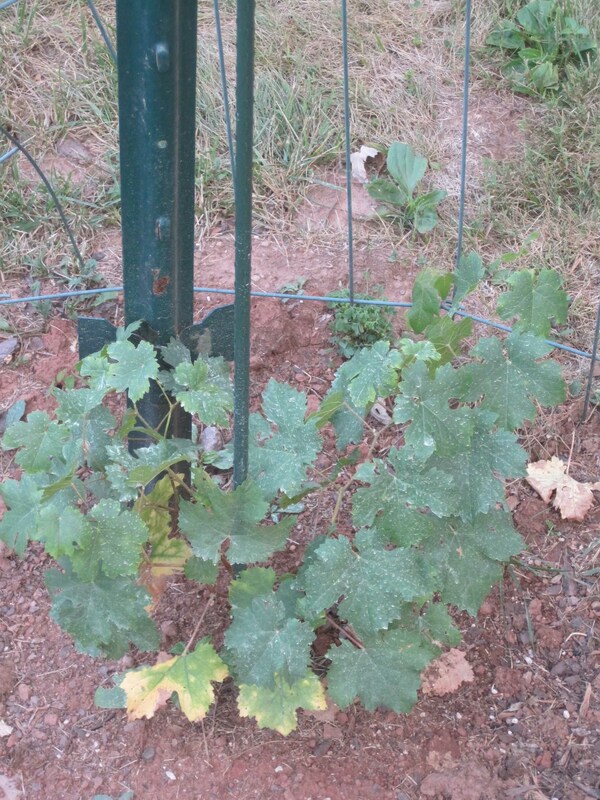 Here and there, we spotted a few cab franc grapes turning purple, but the vines we actually worked on were Viognier, Virginia’s signature white grape. (Actually, while the Virginia Wine Board has declared Viognier to be the Commonwealth’s Signature Grape, I prefer to think of it as the signature white. Cab Franc and Petit Verdot are my choices for reds. In Memorium: Honoring the fallen clusters. In any event, a little bit of my heart lay on the ground with each cluster of grapes. And I was only the hired (well, volunteer) help. I can’t imagine how agonizing it is for the owner of the vineyard to drop fruit, knowing he or she is reducing the vineyard’s yield significantly with each clip of the pruning shears. Fortunately, this is one kind of heartache that can be cured by opening and tasting a bottle of wine that has benefitted from the “Green Harvest” of dropping fruit. Wine is often said to be made in the vineyard, and the best is made by vineyards like DuCard that are willing to sacrifice quantity for quality. It’s scary to think about how many predators are out there waiting to attack the average vineyard. Birds, bees, foxes, rabbits, deer – Even Bambi can’t be trusted! – and a host of insects, from the potato leafhopper to the Japanese Beetle, want nothing more than to devour the vines, from their leaves on down to the grapes themselves. And that isn’t counting the fungi. 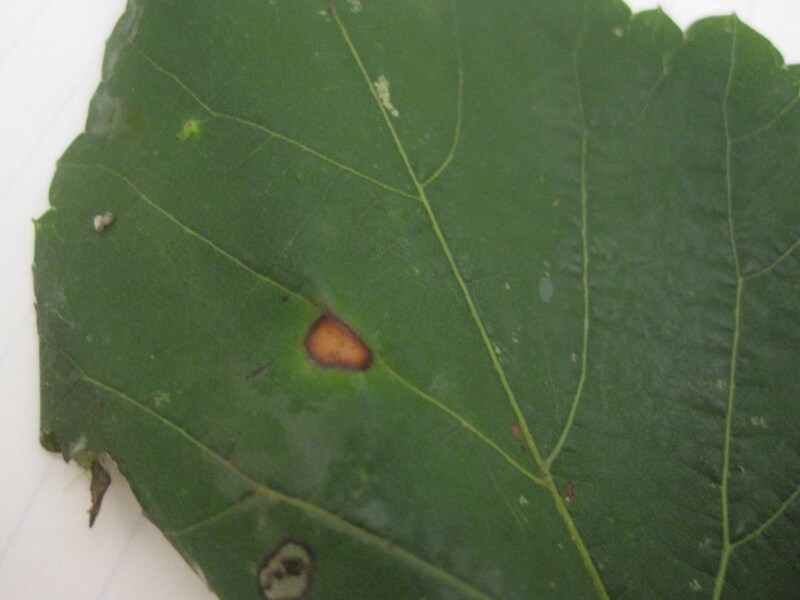 Last weekend at Monticello, Gabriele Rausse taught a class on vineyard diseases that was as wonderful (Gabriele and Monticello) as it was depressing (birds, bees, deer – you get it). The predatory Bambis of the world can be controlled fairly easily with fences. Birds, which begin taking a serious look at the vines after the sugar level rises almost to the point where it is time to harvest, can be scared away with foil streamers that are hung at intervals so that they fly in the breeze. But fungi are a different story. They require lots of attention, and no small amount of chemicals. 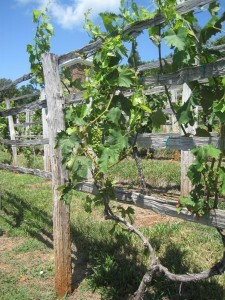 Unlike California’s wine valleys, where vines grow in dry heat with cool nights and little rain, Virginia vineyards are subject to heat, humidity and lots of rain. (Especially this year.) 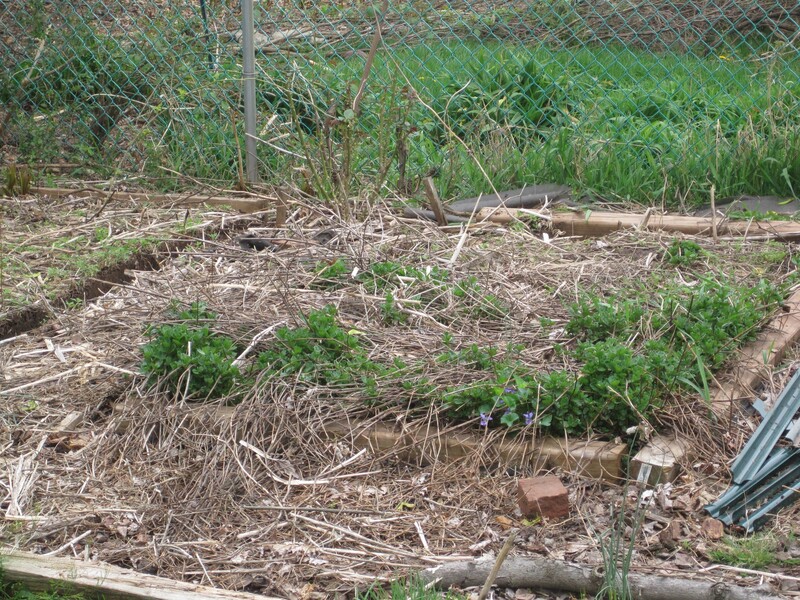 All of which provides a good, but hopefully not perfect, environment for a variety of fungal diseases to take root, so to speak. Black Rot, Downy Mildew, Powdery Mildew, Botrytis (and not the good kind of Botrytis, the “noble rot” responsible for Sauternes) and many other diseases just lie in wait for the conditions that enable them to ruin a vineyard. Downy Mildew – similar to Black Rot, but no dark borders around the spots. So, that means spraying. 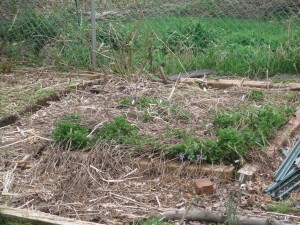 Not just once or twice, but routinely, weekly and especially after three-quarters of an inch or more of rain. 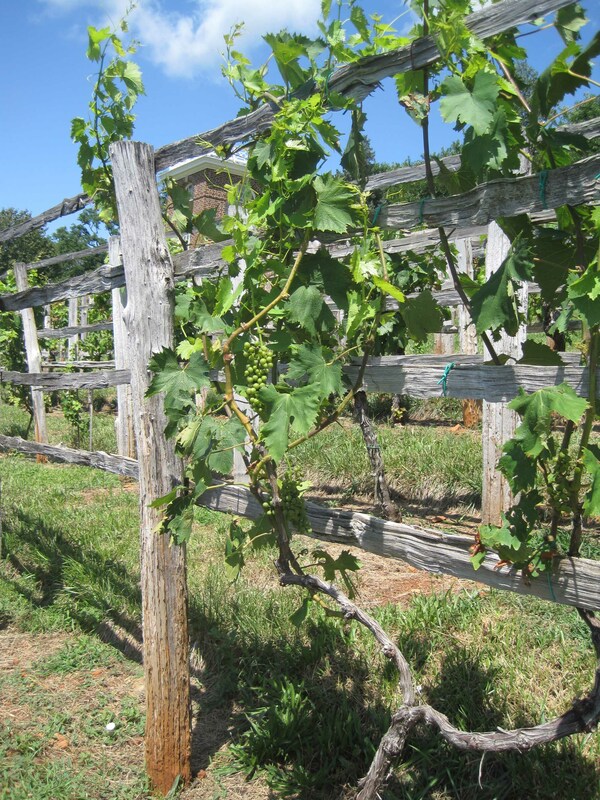 We’d love to go organic and dispense with the spraying, but it’s not possible in Virginia, at least not with vines. I don’t know if other fruits and vegetables can be grown in Virginia without spraying, but I’m inclined to think you can’t. Certainly, Virginia Tech’s Cooperative Extension service web site has tons of information about spraying programs for fruit and vegetables, which implies that fungicides are needed. 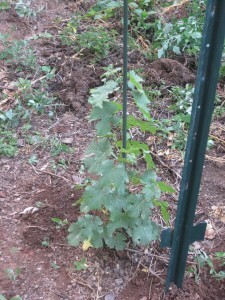 But whatever the case for other types of fruit, wine grapevines require spraying. That’s also true in other environs. Gabriele said they had to spray in his native Italy (the Veneto region), for example. So, it’s not a crime to spray. But it does make for a lot of work and expense, one of the reasons, in fact, that Virginia wine is so expensive. And by the way, if you're interested in this subject, the best source of information availale, at least for Virginia viticulturists — and probably for grape farmers everywhere — is Mizuho Nita's blog. 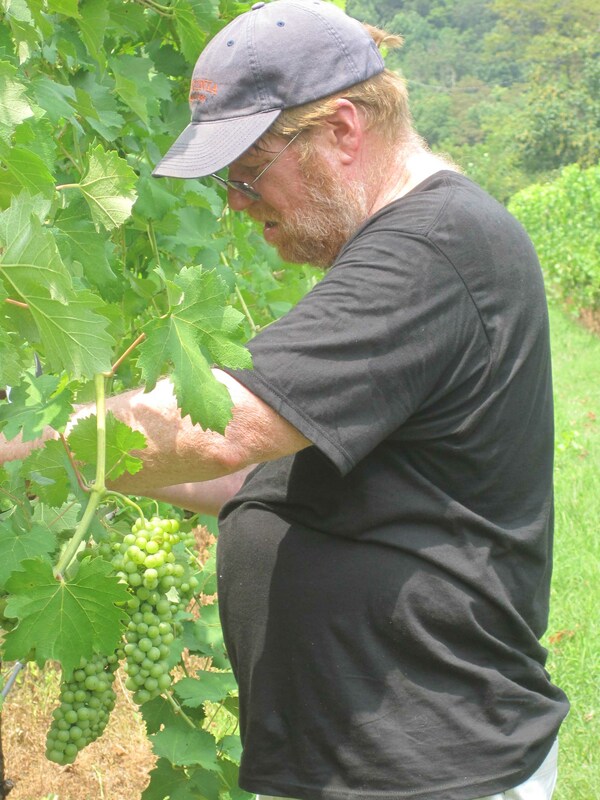 It's a must-read for anyone interested in growing wine grapes in Virginia. Spraying is a discipline, and it's one of those things you have to do when it's needed, whenever it's needed, with no exceptions. Hard work, for sure. But I think it's worth it, and that the end result of all that pest management will be wine that is truly memorable. Continuing the Potato Leaf Hopper saga, which strictly speaking hasn’t yet risen to the level of a saga, it looks like we’re making some progress. 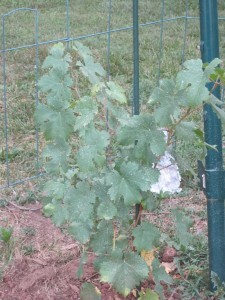 We evaluated our Nelson County vines over the weekend and are reasonably happy with what we saw. 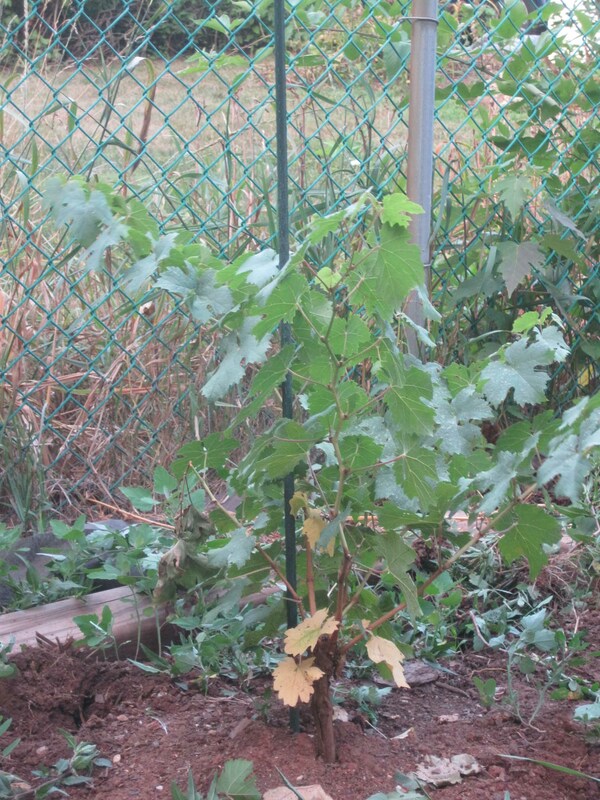 The new leaves looked healthy and disease free, and the vine seems to be growing nicely (well, with the exception of one vine, which appears to be the runt of the litter). 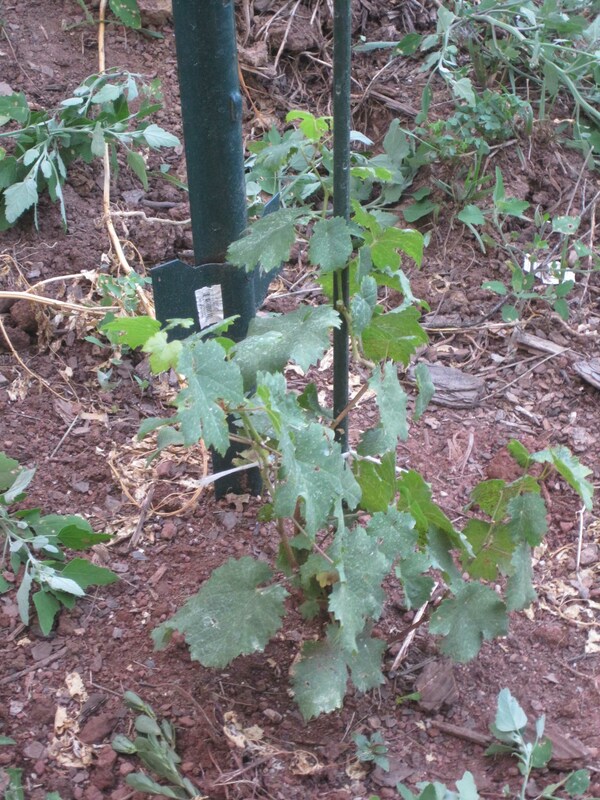 This Cab Franc vine is growing slowly, but it appears healthy. No holes in the leaves from Leafhoppers, and good color. Most important, the Potato Leafhoppers appear to have all but vanished. Two weekends ago, they were gone. Last weekend, we found one or two, and removed them by hand. We’ll check again next weekend, but for now, the Vineyard Goddess is resting easy, and we doubt we’ll need to hit the vines with another dose of pesticide. According to the Compendium, the potato leafhopper breeds in the Gulf Coast states over the winter, then grow in number through March and April before migrating northward, distributing themselves over most of the U.S. The leafhopper harms grapes “by mechanically injuring and blocking vascular tissue, by injecting toxic enzymatic secretions, or by a combination of both mechanisms.” You ever see Trump blocking any vascular tissue? In any event, it appeared that the Leafhopper was doing considerable damage to the vineyard, and we were ready to go to war with it. With luck, we might have put that pest behind us, which will free us up to deal with the myriad other problems that plague vineyards. Like overly acidic soil. Or Downey Mildew. And someday, maybe, birds, foxes and bees. Stay tuned for the next report from the front. It’s hard to imagine a better venue for the study of viticulture than Monticello, the home of America’s first great connoisseur of wine, and so I counted myself fortunate that this weekend’s class on vineyard diseases was taught on the small mountain that was Jefferson’s home. The vineyard at Monticello - just as Jefferson hoped it would be. Note the ancient trellising system. I’m sure someone will question my description of Jefferson as the nation’s first great wine connoisseur, preferring another term in its place, but I think my words cover the subject better than any others. Jefferson is sometimes called America’s first great viticulturist, and the notebooks he kept while touring the world’s great wine regions reflect an extraordinary knowledge of the subject. 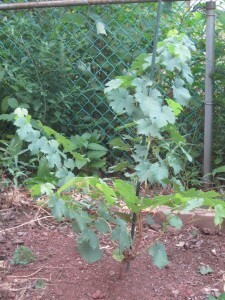 Sadly, though, he was never successful in growing wine grapes at Monticello. But he loved wine – that too comes across in his notebooks – and he devoted huge sums of money, as well as significant amounts of his time, toward procuring and enjoying wine (more on this subject in a future post), and so it seems most accurate to think of him as not just a lover of wine, but as the young nation’s foremost authority on the subject. A connoisseur, and yes, much more than that. consider how many hours that men of his age spent on the things we devote minutes or hours to – letters and travel, among them – it is nothing short of astonishing that Jefferson accomplished so much. And for those of us (hopefully all of us) who care about the freedoms inscribed in the First Amendment, Jefferson is a name to be revered. While Madison may be the author of the First Amendment, Jefferson’s influence was vital. Free speech, free press, and the separation of church and state were central concerns for him. The Cavalier Daily, the student newspaper of the University of Virginia, where I worked for two years while occasionally attending classes, cited Jefferson proudly and perhaps defiantly in its masthead: “For here we are not afraid to follow truth wherever it may lead, not to tolerate any error, so long as reason is left free to combat it.” I always thought that quote was the most elegant and eloquent summation of the argument for a free press that I have ever heard. Back to the class. 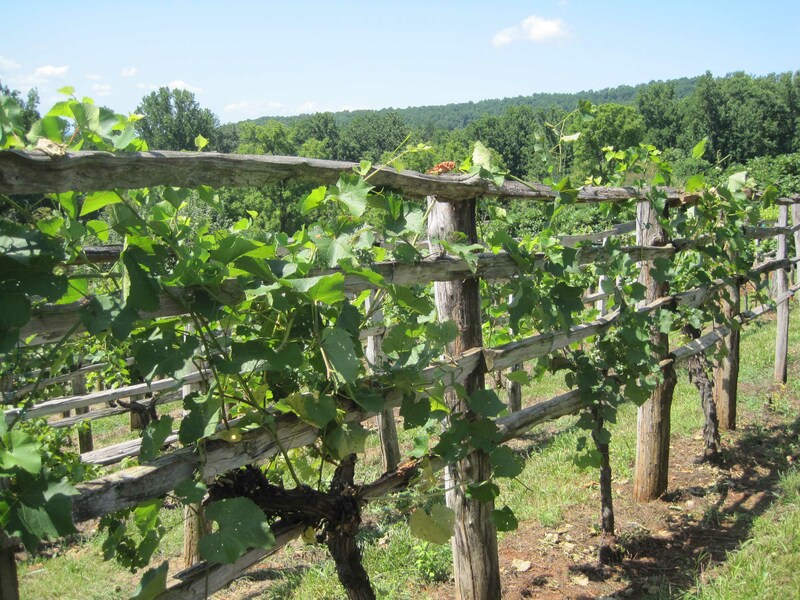 It was taught by Gabriele Rausse, Monticello’s assistant director of gardens and grounds and the father of Virginia’s wine industry. Gabriele arrived in the United States in 1976 from his native Italy, thinking he needed to learn a bit more English before returning to the wine country of Australia, one of several wine regions he apprenticed in. At that time, the prevailing wisdom was that Vitis Vinifera, the great wine grapes of Europe, could not be grown in Virginia. Gabriele decided to contest the prevailing wisdom, even though, as he told us on Saturday, everyone thought he was crazy. But of course, he was right. Mammolo Toscanas at Monticello – and, yes, now you know where we got our Mammolos and why they are so important to us. Today, Gabriele is the state’s best known vineyard consultant, and the wines he makes himself are elegant in the best traditions of Europe and, yes, Virginia. More on Gabriele in a future post, but for now, let me just say, that if you are lucky enough to taste his wines at a Virginia wine show, you should buy some, as it may be the only chance you get. His winery produces no more than 1,300 cases a year, so they are not only treasures, but they are rare. Monticello and Gabriele. Life doesn’t get much better. I’ll post something in a few days about the class itself, but for now, I’ll just say that for those of us involved in the Virginia wine industry, even amateurs like me, the spirit of Jefferson will always be an inspiration. 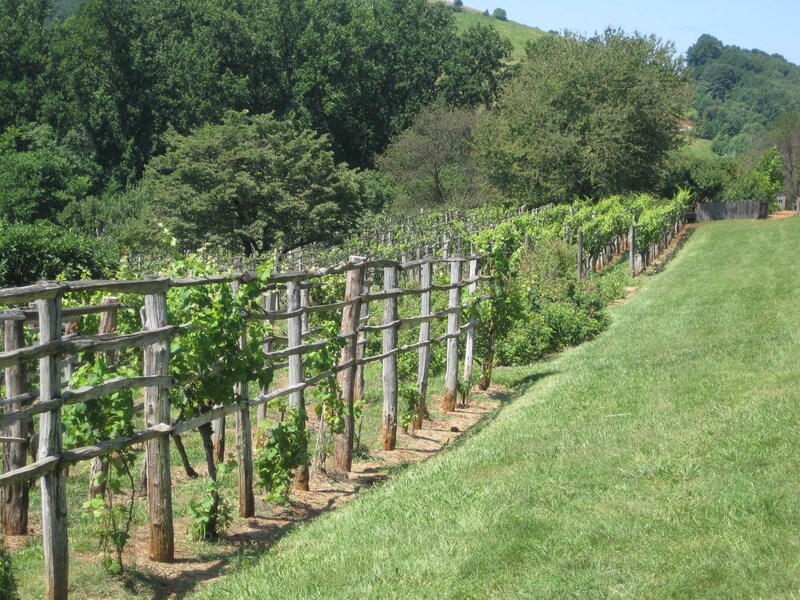 Coming up next weekend: the North American Wineblogger’s Conference in Charlottesville. It says a lot about how far the Virginia wine industry has come that this conference is being held in Charlottesville, in the center of the Monticello AVA. 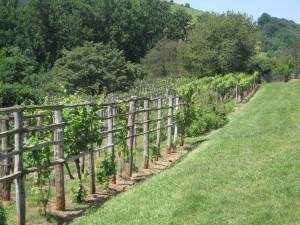 And one of the events I am looking forward to most is the wine tasting at Monticello. It’s not like I’ve never been to a wine tasting, but the very idea of tasting wine at the home of Jefferson is humbling, to say the least. I’m sure Jefferson will be watching over us, and wishing for just a sip of a true Virginia wine. The Vineyard Goddess was not happy. 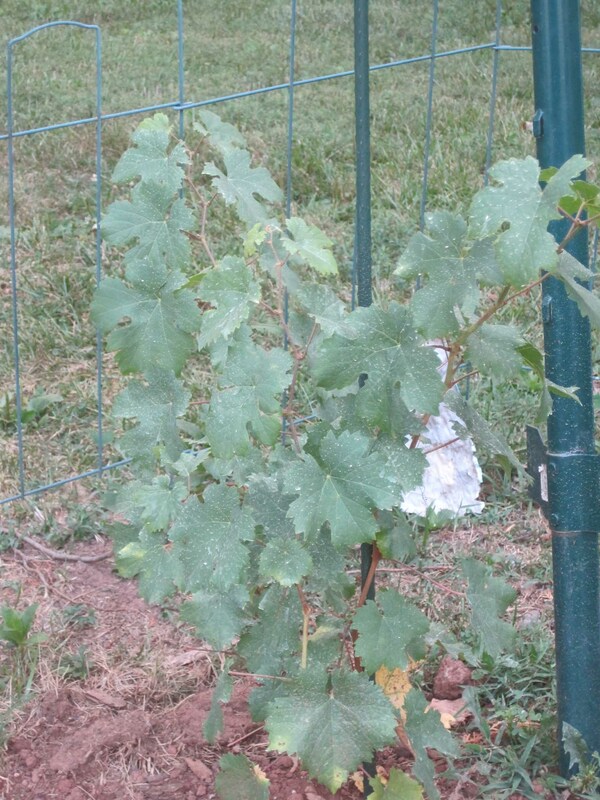 Our Nelson County vineyard was looking decidedly unhealthy. The leaves on the vines were pale, and they were full of holes. My wife, the Vineyard Goddess, spent hours inspecting the vines, looking through books, and searching the Internet for answers. 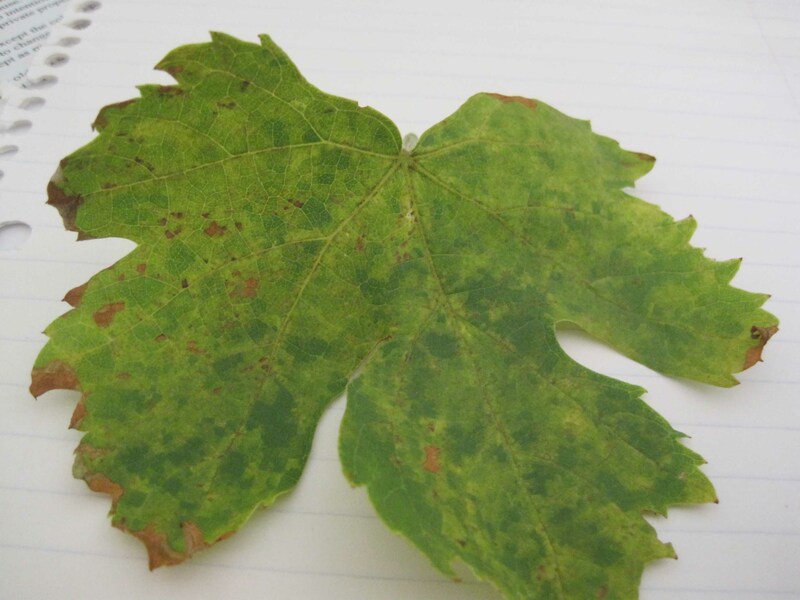 Finally, she decided to email a photo of the not-so-healthy leaves to a Virginia Tech grape pathologist. Virginia Tech’s Agricultural Research and Extension Center is a wonderful resource for Virginia Viticulturists, and they could not be more helpful. Within a few hours, she had an answer. It was most likely an insect that was doing the damage. Although we hadn’t seen any bugs in the vicinity, the Vineyard Goddess decided to stake out the seven vines until she found what she was looking for. She didn’t have to wait long. There, on our Mammolo Toscano – I could almost hear her shriek, “not the Mammolo!” – were two tiny green bugs. They moved fast, but not as fast as the Vineyard Goddess. Pinching one between thumb and forefinger, she carried it back to the house, combed through our viticulture books as well as the Internet, and made a positive ID. It was a Potato Leafhopper. We had never heard of a Potato Leafhopper, and had no idea why it had given up on potatoes and turned to our vineyard for nutrition. But it had. 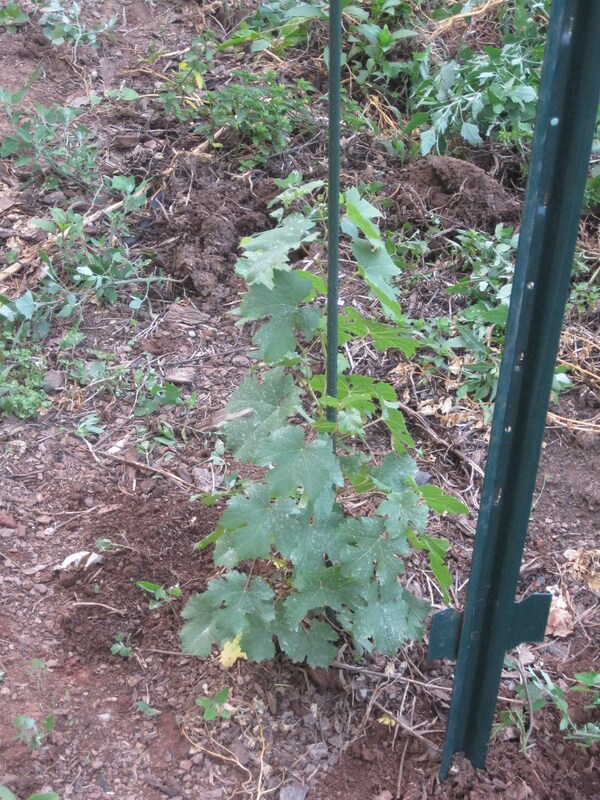 VG immediately dusted the vines with a cure-all pesticide, and we both crossed our fingers. Stay tuned for the next report from the front lines of our battle with this pest.